iTunes Match is an upcoming iCloud feature that will allow users to upload and stream their own personal music collection (this includes songs not purchased from iTunes) to/from the cloud. iTunes Match is a subscription based service that starts at just $24.99 a year and will be released soon. With the release of iTunes 10.5.1 beta 2 came the ability for developers to use iTunes Match on the Apple TV 2G (before the official release). If you would like to enable iTune’s Match service on the Apple TV 2G then follow the how to guide below. Step 1) – The first thing you must do is download and install iTunes 10.5.1 beta 2 to your Windows or Mac OS X computer. As this is a beta version of iTunes you will need a developer account to download iTunes 10.5.1 beta 2 legally. 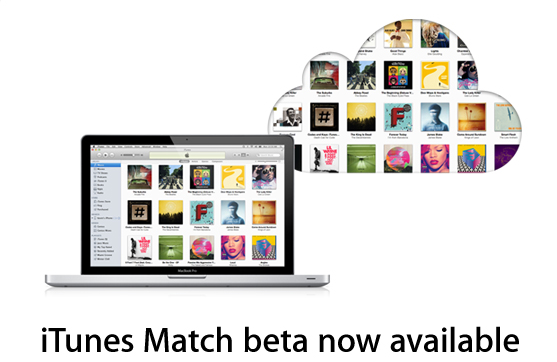 Step 2) – Next launch iTunes 10.5.1 beta 2, go into the iTunes Store and enable iTunes Match. Upon enabling iTunes Match your music library will begin uploading to the cloud (wait for this to finish, or at least until a few songs have been uploaded before continuing to Step 3). Step 3) – You are now done playing around in iTunes. You will next need to head on over to your Apple TV 2G, go into the Settings Menu, the General tab, the iTunes Store tab and finally you will see an option to enable iTunes Match (do this now). Note: If you see iTunes Match upon launching your Apple TV 2G then you do not need to enable it through the Settings Menu. Step 4) – After enabling iTunes Match on your Apple TV 2G you will see a new Music Section that will be shown in your list. After iTunes Match/iCloud configures itself you will be able to stream music from the cloud on your Apple TV 2G. Congratulations! Let us know if this how to guide for enabling iTunes Match on your Apple TV 2G worked for you in the comments section below. For more how to guides like this one please visit iJailbreak’s how to section by clicking here.